Getting around the center of Puerto Vallarta is extremely easy. Many visitors who come to Vallarta choose to stay close to the center of town, which is basically anywhere in what is called Old Vallarta. This area of town is where you find the charming cobblestone streets of Downtown Puerto Vallarta (called El Centro by locals) and the inviting restaurants and outdoor lounges of the Romantic Zone (La Zona Romantica). While this is the most popular areas of Puerto Vallarta, there are other zones that visitors should definitely take advantage of (gorgeous beaches on the south side of Vallarta's bay that are only accessible via boat, the resort-lined Zona Hotelera, and the lush tropical forests outside of the city in the Sierra Madre Mountains). Before coming to Puerto Vallarta, you should acquaint yourself with methods of getting around the city and decide which zone (Old Vallarta or the Hotel Zone) you would most like for your accommodations. Downtown, Old Vallarta, and the Zona Romantica are all completely pedestrian-friendly. There really is no better way to fully immerse yourself in this area than by strolling around its narrow cobblestone streets. Take your time walking around this area, stop in to get a coffee at local joint, get a drink at a hip bar, and have a sit-down dinner at one of the many charming and inexpensive restaurants in the area. Travelers seeking a stay in a historic building should stay in this area. 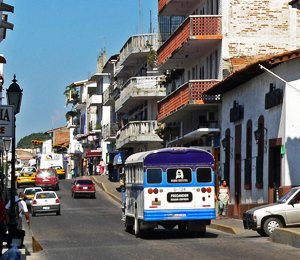 The local bus system in Puerto Vallarta is highly effective, with most bus routes operating every five minutes from 5AM to 11PM. A one-way trip will cost you less than 1 US dollar (5 Mexican pesos). Jumping on one of the buses is a great way to get from downtown to the larger hotels and resorts in the north part of the city. Hailing a taxi is also quite easy from the center of town, particularly along the popular ocean-side boardwalk known as the Malecon. Some of the best beaches in Puerto Vallarta are only accessible by boat. These are the beaches located on the south side of Vallarta's principal bay, such as Playa Las Animas, Quimixto, and Yelapa. Ferries depart three times a day from the pier located at Playa de los Muertos in downtown Vallarta, making stops in each of the aforementioned beaches. Currently, the ferries are departing at 10AM, 11AM, 11:30AM, 12:30PM, 4PM, and 4:30PM. A round-trip ferry ride to any of these beaches costs about 17-18 US dollars (220 Mexican pesos). These are known as the most beautiful and pristine beaches in the Jalisco state of Mexico, where Puerto Vallarta is located. The best way to get out of the main areas of Puerto Vallarta to see the gorgeous and teeming natural habitats of the Sierra Madre Mountains is to reserve a spot on one of the Puerto Vallarta tours that take you to that area. In and around Sierra Madre Mountains you will find a dense tropical forest teeming with all kinds of exotic plant and animal wildlife. Best On Puerto Vallarta offers some of the best Vallarta tours out to the tropical rain forest of Puerto Vallarta. A trip out to this area is an excellent way to see a side of Puerto Vallarta that is more off the beaten path. Try one of the Canopy Zipline Tours or one of the ATV Tours to get the full experience of the best in Puerto Vallarta nature.